I have a thing for cabinets. Especially little cabinets with little drawers and little shelves too. I can't seem to pass them up when I find them. Especially if they are vintage and cute. If you have been reading my blog for awhile, you may already know this about me. Here are just a few pictures of some of my little cabinets. I found this cabinet on my last trip to California. It was at La Maison Rustique Barn Sale and I had to have my dad ship it up to Oregon for me. It is currently residing in my sewing room where it holds supplies. 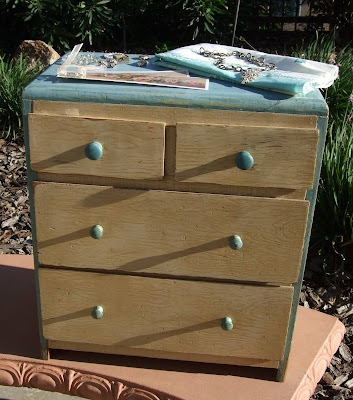 Love this little chest of drawers which my friend Michelle had in her home. As soon as I saw it I knew I had to have it. I told her that if she ever decided to get rid of it to let me know. About a year later she called me and told me I could buy it from her. Yippee! I bought this tiny stepback cabinet on ebay. It is currently in my bedroom and home to my pill box collection and some other cute little finds. This little shelf I got from Isabel. She found it on one of her thrifting adventures and I just knew it would be the perfect cabinet for me. I just love anything with scallopy edges. Found this little cabinet at Monticello in Braeda's booth. I seem to find lots of stuff in Braeda's booth. 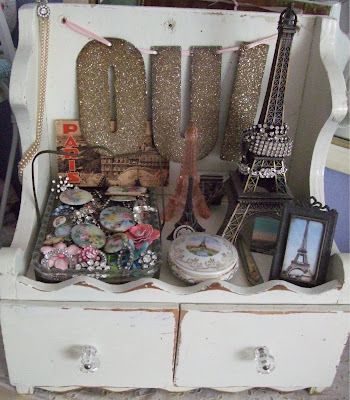 Anyway, it sits on my dresser in my bedroom and holds my little "homage to Paris" items. 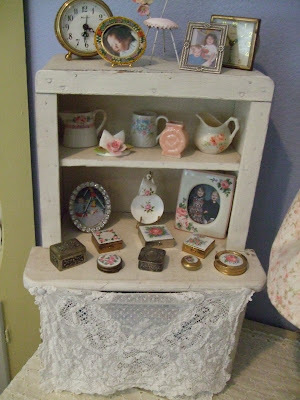 This picture is an older one and I have since relocated the rhinestone and hand painted pins to a vintage jewelry box. This little shelf is in my bedroom too. I forget where I found it, but it is the perfect size to hold a few of my vintage flower pots. I found this adorable little cabinet at a shop in Lake Oswego. At first I didn't get it because I thought the price was too high, but after going home and thinking about it, I went back and bit the bullet. 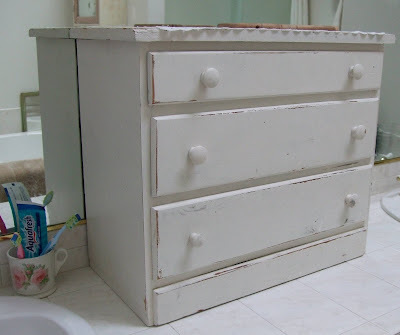 I love how the drawers are bare wood and the rest of the cabinet is painted. It didn't have any knobs that went with it so I "borrowed" some from Joy. I love that they are mixey matchy. Which brings me to my latest little cabinet acquisition. I found this cabinet last week on Craigslist and knew instantly what I wanted to do with it. I wish I had taken a before picture as it had some ugly little skinny 70's legs on it which of course came right off. Now it's sitting on my bathroom counter holding all my junk. I still need to decorate the top though. I'm thinking about an old jar with soaps and maybe some vintage decanters with mouthwash. You get the idea. I did have another little cabinet here, but I was never really thrilled with how it looked. So, as I already have way too much furniture in my house I decided to part with it and took it to Monticello. Speaking of Monticello, I was very pleased to see that several of our items have sold when I went over the other day. It was a good thing I did too as our booths were a mess. I was able to straighten up and make everything cute again. I want to thank Angela for giving me this award. It's always so nice to be recognized in this way. Thank you so much! I had a fun day of thrifting yesterday and found a few cute things which I will show you on my next post. Also, I will hopefully be able to share with you at least one of the chairs that I am re-doing for my dining area. So, come on back, won't cha? Added note: So many of you asked about where I found the Romantic Country Magazine. I found it at Safeway, but I have also found it at other stores like Albertsons and Target. I read that you can now subscribe to it, but I can't seem to find it on any of the magazine sites. Any ideas? Your little cabinets and shelves are so cute. I have a little one I just bought at a garage sale nearby. The lady who held the sale was a bit different. The drawers were filled with odds and ends of things, including a CD player. When I asked if she knew about them she said yes, the CD player doesn't work anymore! So I got to come home and throw her junk away. 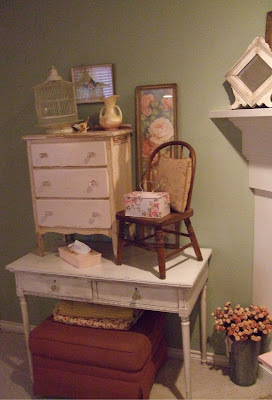 But I got a good deal on my little cabinet that hopes to make its home in my sewing room soon. I'll share it on my blog soon. I love your yellow flower pots! I know exactly how you feel about little cabinets, shelves and cupboards! I seem to always fall in love with them, too. 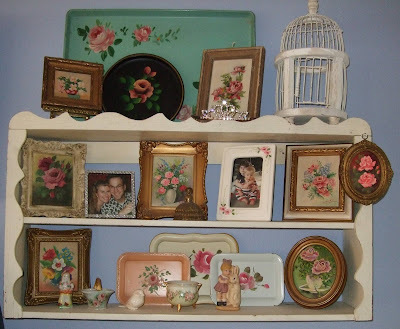 I loved seeing all of your pictures of yours with the wonderful displays of vintage items! What delightful cabinetry! I love the little case I got from you. It is now painted white and mod-podged with book pages, and hanging on the wall in the guest bedroom, and of course, filled with dolls. Keep up the good work. I'm off to Monticello later today!!! Hi, I called the phone number listed for the NY office and subscribed to Romantic Country over the phone. The number is in the first few pages where they list all the editors and such. Hope that helps. Come for a visit. Lisa, I just love your collections of little drawers. I found one last weekend and thought of you. 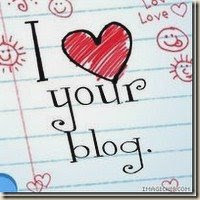 I posted it on my blog today infact. If ever you decide to sell your little green and wood one, let me know. It is just so cute! 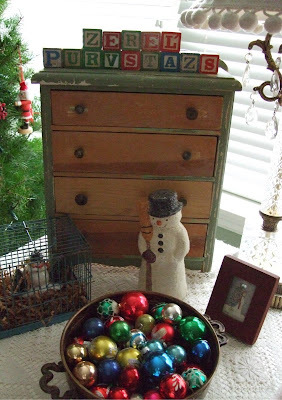 I love the photo with the vignette and the snowman in the birdcage. Just too dern cute for words. Come see this video and prepare to slobber! I also love cabinets! I'm a natural born organizer. I have to be with all the mosaic tiles & other craft stuff I have. I'll stop the car and jump out if someone leaves an old dresser at the curb. Check out this old wood cabinet I painted jadite green and then mosaiced. Shopping Carts, Shelves and Linens, Oh My!